march. the. list. - bitte.und.danke. As this week marks my school’s Spring Break, the only thing on my mind is taking things nice and easy. Granted, there is some work to be done, but I figure I can put it off for just a wee bit longer. Since I’ve already made a to-do list, I’d say that I’m on the right track! 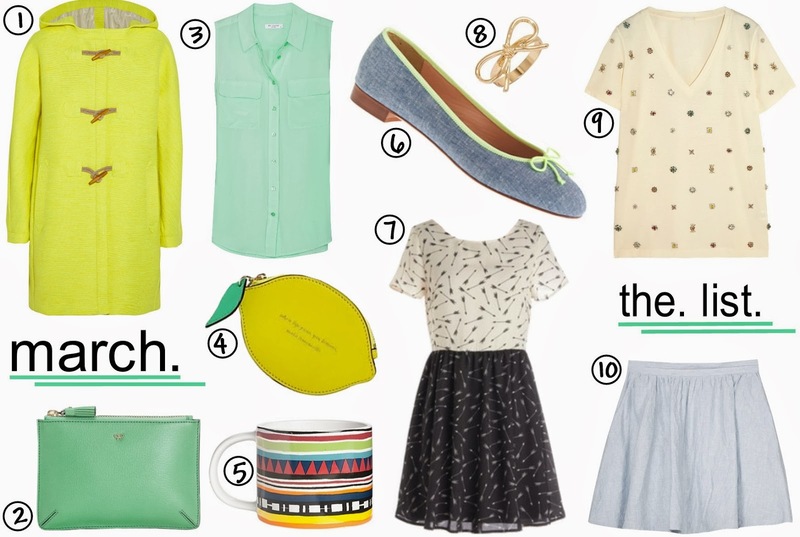 That said, today I’m excited to be bringing you the March edition of “the list.” With St. Patrick’s Day and the official start of spring in sight, I’m currently yearning for pops of green and anything remotely colorful. Don’t get me wrong, though, I’m still very much in a winter state of mind. I have one too many sweaters that I’m not ready to put away just yet. Enjoy! 1. Collection Neon Canvas Duffle Coat (J.Crew)- Straight from J.Crew’s Spring 2014 collection, this neon duffle coat will have you thinking spring in no time! With those toggles, it can’t be ignored. 2. Bespoke Loose Pocket Small (Anya Hindmarch)- Ever since Anya Hindmarch’s Spring AW14 show (read my write-up on it here! ), I haven’t been able to get enough of this London-based brand. Though small and simple, this captivating green pouch couldn’t be sweeter. 3. Sleeveless Slim Signature (Equipment)- Who needs shamrock green, when you can slip into this refreshing, ice green sleeveless blouse by Equipment? 5. Saturday Morning Mug in Strata Stripe (Saturday)- I’m always open to investing in more mugs to sip my morning tea from – I’m digging this cool aztec-printed one from Kate Spade Saturday. 6. Kiki Chambray and Grosgrain Ballet Flats (J.Crew)- Springing forward, I can’t think of anything more appropriate than chambray flats. And that neon bow: perfection. 7. Arrow Dynamic Dress (ModCloth)- A no-nonsense arrow-printed dress that appeals to my minimalist side. 8. Jumbo Bow Ring (BaubleBar)- You should know very well by now that no bow flies under my radar. If it’s out there, I’ll find it. No shame in adding one more bow ring to my collection, right?! 9. Embellished Cotton Jersey T-shirt (J.Crew)- The basic white tee just got re-imagined in a major way. Embellished with jewels, this one from J.Crew is a showstopper. 10. Kaylea Skirt (Joie)- It appears that my chambray obsession has now moved onto skirts, shoes and everything in-between!